With playing described as “stunning” (The American Organist) and “pure euphoria for the audience” (The Washington Examiner), and praised for its “compelling intensity” (The Irish Times), Scott Dettra is one of the leading American concert organists of his generation. He combines an active performance schedule with his post as director of music and organist at the Church of the Incarnation in Dallas, where he leads a large and vibrant music program in the country’s sixth largest Episcopal parish. Prior to his appointment in Dallas, he was for five years organist and associate director of music at Washington National Cathedral, where he served as principal organist and assisted with the direction of the Cathedral choirs. Mr. Dettra has performed extensively throughout the United States, Canada, and Europe. Recent and upcoming performances include appearances in New York, Los Angeles, Chicago, Boston, Washington, Atlanta, San Diego, Phoenix, Austin, Winnipeg, Barbados, and Germany. 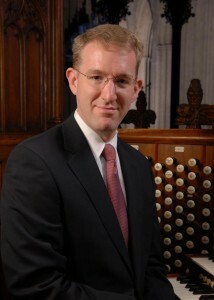 He has performed at national conventions of the American Guild of Organists, the Association of Anglican Musicians, and the Association of Lutheran Church Musicians. Festival appearances include the Lincoln Center, Carmel Bach, and Arizona Bach festivals, the Bermuda Festival of the Performing Arts, and the Piccolo Spoleto Festival. A native of Wilmington, Delaware, Mr. Dettra holds two degrees from Westminster Choir College and has also studied jazz piano at the Manhattan School of Music. His principal organ teachers have been Joan Lippincott, Dennis Keene, and his father, Lee Dettra.